Architects love to draw, anywhere on anything. 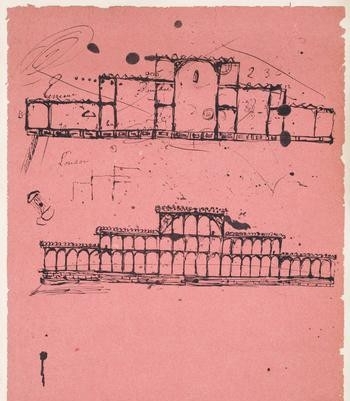 Napkin sketch design concepts can be traced back as far as 1850, when the head gardener at Chatsworth House, Joseph Paxton, sketched on a napkin the glass and iron framework for what would become the Crystal Palace - the largest building on earth. This sketch, inspired by the greenhouses Paxton built for tropical plants, was developed into the drawings used to construct the gigantic exhibit hall for the Great Exhibition of the Works of Industry of All Nations hosted in Hyde Park, England. Architects have continued this spontaneous napkin-sketching practice as well as using many other media types to quickly communicate design intent to others and bring an idea to life. Development of a detailed listing of spaces and corresponding sizes to determine overall project size and cost. Many services are required on new and renovated building projects - drawings, of course, are one of them. Talk to an architect who can see the big picture, is able to collaborate, and can be a knowledgeable resource on the complete project process. Anyone can doodle on a napkin, but without the research, insight and creativity that bring a project to life - It’s just a dirty napkin. For 30 years, MILLER Architects has specialized in Health Facilities, completing over 500 designs. This experience gives us unique insight into the possibilities available for any healthcare facility, as well as allowing us to grow in non-traditional arenas, such as project financing and development. Thanks to these opportunities, we at MILLER are proud to have fully funded hundreds of millions of dollars in projects for our healthcare clients. We have also developed and now lease over a quarter million square feet of healthcare facilities.